Good habits make good men. What finer habit can you develop than making periodic purchases of New Order shares? Delta Work bought 100 shares. This sent us over the 1 trillion 87 billion isk mark and earned him a Supreme Protector's Tip of the Hat™. 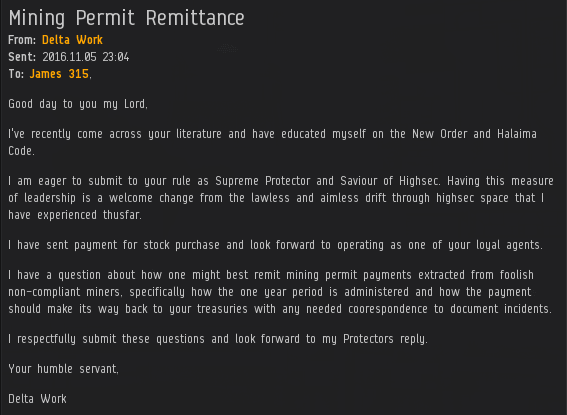 He also got his questions about mining permits answered in a personal EVEmail from the Saviour of Highsec himself. Things are definitely looking up for Delta Work these days. Coincidence? I think not. But if you doubt, try buying some shares for yourself! The personal touch (no, not that kind) goes a long way in making someone feel just that little bit special. A nice gesture from our Saviour. our Lord and Savior's display of generosity and kindness shall be an example for all of us!